This way to the future…. Third Angle’s 2019-20 season takes you for a walk on the wild side. Our Concert Series stages a raucous rebellion against the stories we tell ourselves—about where lines are drawn, the consequences of our actions, and the depth of loss we face should we fail to immediately step up and protect this precious planet. In the Studio Series, we’ll bring you the movers and shakers of next-gen contemporary music. From Pulitzer Prize-winner Caroline Shaw, to superhero women of the nation’s top brass sections, to Oregonians sharing the gifts of inspiration they received growing up in this special homeland, we’ll quench your thirst for the new and defiantly creative. 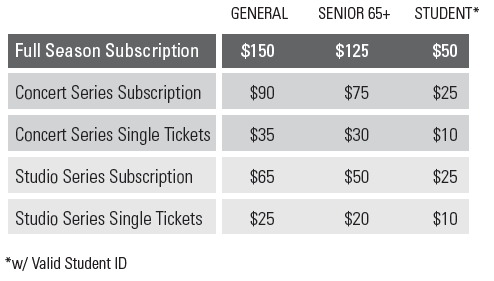 Purchase your subscription package online here, call the Third Angle Box Office at 503-331-0301, or email us your request. Third Angle leads you past the pool tables and down the back stairs for an underground set of music that grooves. Hear works of Steve Reich, Philip Glass, Shelley Washington, Lee Hyla, and Eve Beglarian in one of Portland’s favorite jazz clubs as 3A blurs boundaries and gets your feet tapping. Gentrification and Portland’s racist past go under the microscope in Darrell Grant’s jazz-classical chamber opera, Sanctuaries, with a libretto by two-time National Poetry Slam Champion Anis Mojgani and directed by Alexander Gedeon. This latest site-specific commission challenges us as a community, drawing on personal stories from the Albina neighborhood to truly listen to and acknowledge marginalized voices while addressing issues of whiteness, privilege, and discrimination. Genghis Barbie, the world's "leading post-post-feminist all-female horn experience," delivers to you a visceral and unadulterated musical adventure. The Barbies, who include stellar members of the New York Philharmonic and Seattle Symphony, will perform their own arrangements of everything from pop music to contemporary classical works and beyond. Composer, instrumentalist and vocalist Caroline Shaw is a triple threat, and the youngest Pulitzer Prize-winning composer in history. We’ll give the world premiere of her latest string quartet, commissioned by 3A, with Caroline also joining us for a special performance of her favorite new works. Benefit from a Season Subscription!